With Black Lightning, DC launched its first television show starring a black superhero. It's a milestone that's been a long time coming, but it's not the first time Jefferson Pierce, a.k.a. Black Lightning, has managed to break a long-standing barrier: since first appearing over 40 years ago, the character has served as a member of the Justice League, the Outsiders, a solo superhero, and even provided the DC Universe with an interesting legacy of heroism. From his origins on the page all the way to his current status on the screen, here's the fascinating truth behind Black Lightning. While creators and characters of color had always existed in comics, the first three decades of the superhero genre were overwhelmingly white. In the late '60s, however, that began to change. At Marvel, Stan Lee and Jack Kirby introduced the Black Panther in the pages of Fantastic Four #52, with Kirby later saying that the character was created after the simple realization that none of his comics had any black characters, leaving a lot of readers without any representation on the page. In 1972, Marvel followed up with Hero For Hire #1, making Luke Cage the first black superhero to headline his own book, with Black Panther taking the lead role in Jungle Action later that year. At DC, however, things moved a little more slowly. In 1977, Tony Isabella, a writer who had previously worked on Luke Cage's adventures, was hired to help create their first headlining black superhero. After rejecting the editors' original idea, Isabella and artist Trevor Von Eden created Black Lightning. Jefferson Pierce was a Gold Medal-winning Olympic decathlete who returned to his old neighborhood in Metropolis to work as a teacher. When one of his students was killed in an altercation with the 100, a criminal organization with ties to the League of Assassins that had previous run-ins with Superman and Lois Lane, he decided to hit the streets to take them on himself. If you were wondering about the part in Black Lightning's origin story where Tony Isabella rejected the original plan for their new character, there's a good reason for it: it may have actually been the worst possible idea for DC's first black superhero. 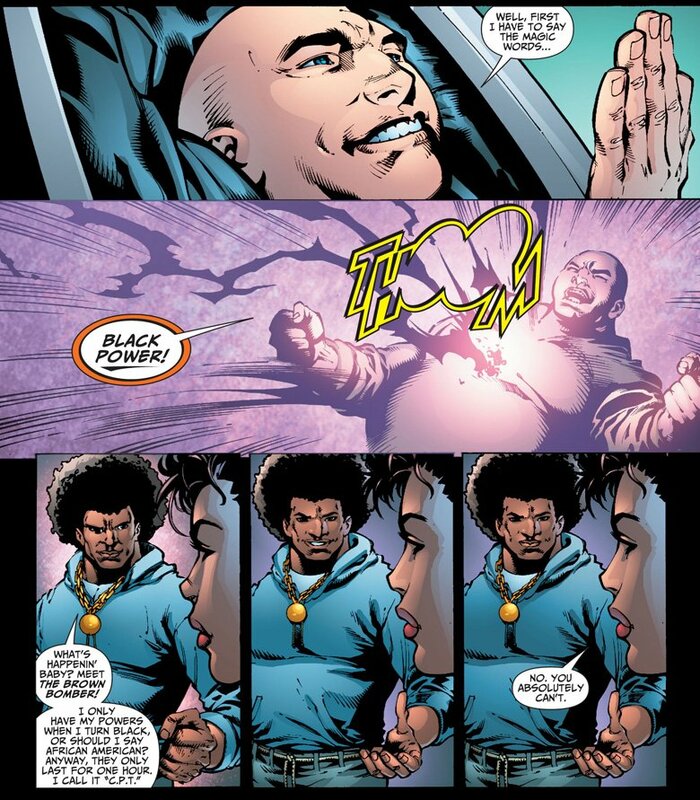 As Isabella revealed on his blog, the original plan was to create a superhero called the Black Bomber, with the hook being that he was actually a white racist who turned into a super-powered black man when he was stressed out, with neither personality being aware of the other. In other words, DC's first black superhero was not actually going to be black, and feature plenty of stereotypes besides. They even gave him a costume that looked like a basketball player's uniform. Fortunately for everyone concerned, Isabella talked them out of it. Thirty years later, though, the character made a pretty surprising return in the pages of Justice League of America. The legendary writer Dwayne McDuffie, probably best known as the co-creator of Static and the head writer for Cartoon Network's Justice League Unlimited, managed to work him into a story during his run on Justice League of America. Now called the Brown Bomber, he was featured as part of the Justice League in a story where the trickster god Anansi had rewritten reality so everything was, well, so wrong that the Brown Bomber could be on the Justice League. It wasn't the first time McDuffie made a tongue-in-cheek satirical jab at racism in superhero comics, but sadly, it would be one of the final times he'd have the opportunity before his death in 2011. 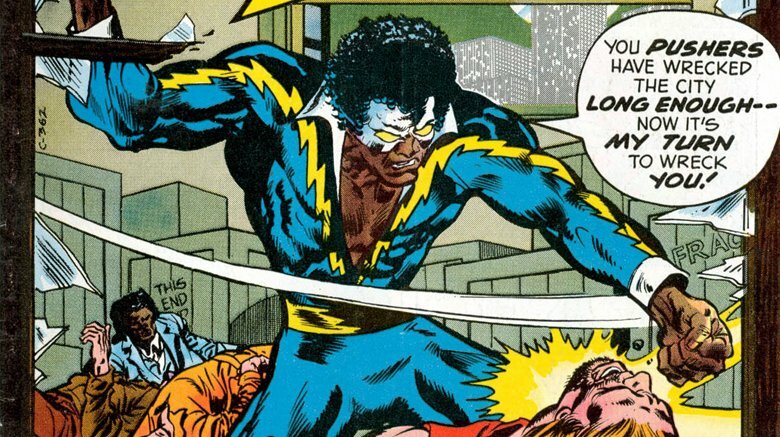 In the mid-'80s, Black Lightning was the subject of a retcon that gave him the metahuman ability to shoot lightning out of his hands and create electrical force fields, and add an extra shock to his punches that would turn out to be pretty telegenic. In the early days, though, Jefferson Pierce didn't have any powers of his own. Instead, he got them from his tailor, Peter Gambi. A family friend, Gambi created not just Black Lightning's costume, but the gadgets that gave him his powers. That might seem like a tall order for a tailor, but it turned out to be part of the family business. In an interesting DC Universe connection, the kind-hearted Peter was the brother of Paul Gambi, a minor character from the pages of Flash who was responsible for making the costumes for all of Central City's supervillains. While Paul would remain the much more well-known brother and even go on to make suits for the Justice League, Peter stayed specialized and essentially filled the role of Black Lightning's version of Alfred. Black Lightning's battles against the 100 led him to his first arch-enemy, Tobias Whale. As the head of the 100's Metropolis branch, Whale bore a pretty striking resemblance to his underwater namesake, including massive bulk and strength. 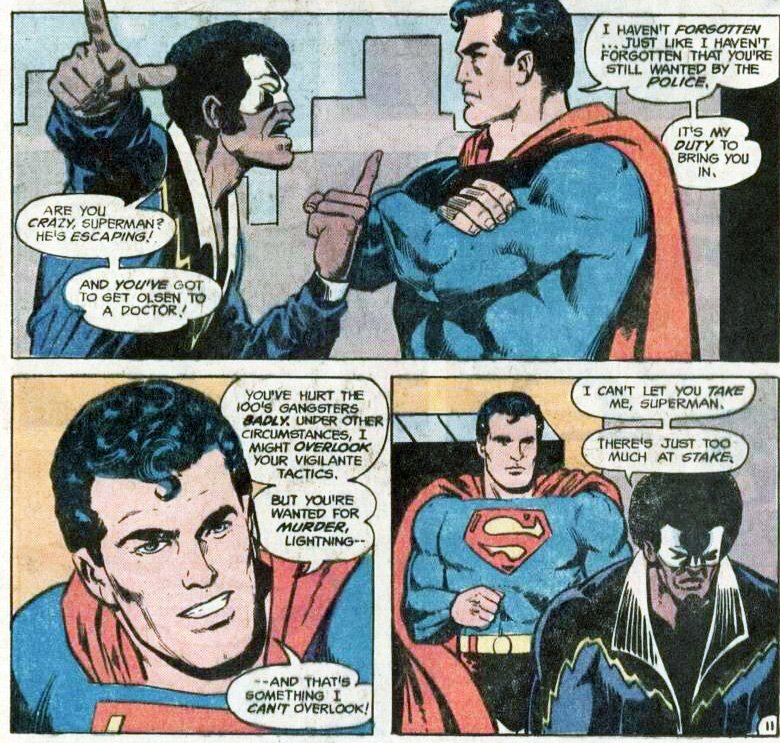 He's far from the strongest character Black Lightning would fight during that original run, though: after being framed for murder and an attack on Jimmy Olsen, he wound up going toe-to-toe with Metropolis's other resident superhero, Superman. That one didn't work out so well for him, but don't worry. They eventually teamed up. The original run of Black Lightning was canceled after only 11 issues, but if it's any consolation, it wasn't alone. Instead, it was a casualty of what fans have dubbed the DC Implosion—a sarcastic riff on a late-'70s marketing push that was called the DC Explosion. All told, 20 titles were canceled as DC's line contracted, and while new heroes like Black Lightning and Firestorm certainly bore the brunt of it, long-running series like House of Secrets and big-name books like Batman Family came to an abrupt end, too. It came so suddenly that most of those series even had completely finished stories, including Black Lightning #12, that stayed in DC's archives until they were published in a book called Cancelled Comic Cavalcade to secure the copyrights. Five years later, Black Lightning got a second chance at stardom thanks to Mike W. Barr and Jim Aparo. 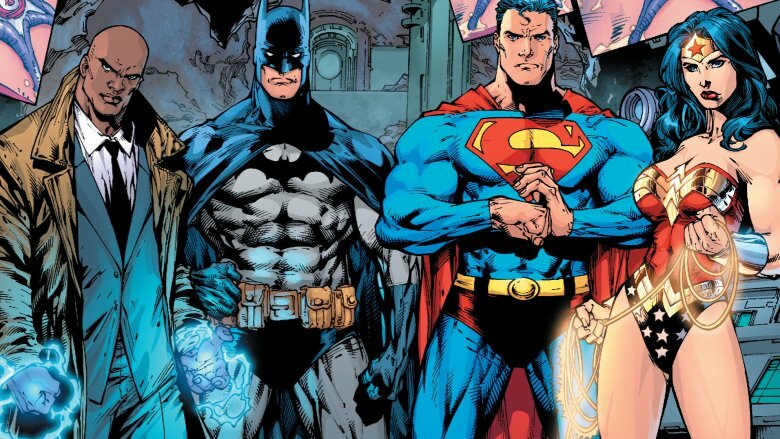 When Batman quit the Justice League over that team's reluctance to cause an international incident in order to bring down a crook, he put together a new team called the Outsiders. 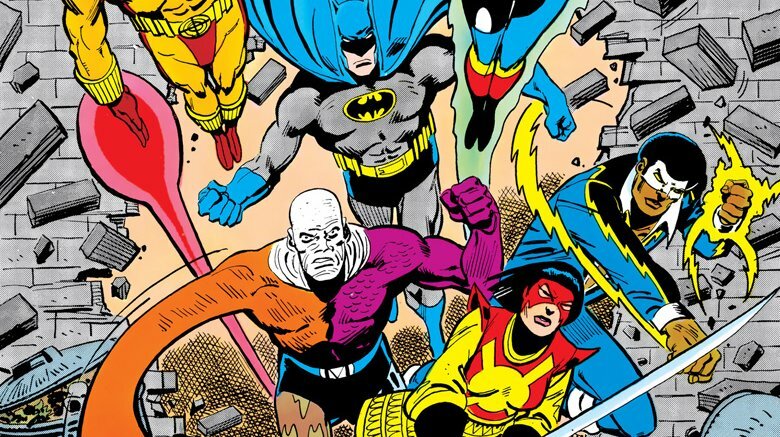 The roster included a handful of new heroes, including Katana, who would go on to appear in the Suicide Squad movie, but it was anchored by a few heroes who had been around a while, like Metamorpho and Black Lightning. Over the course of the Outsiders' five-year run, everyone on the team got a spotlight story highlighting their mysterious and/or tortured past, and Black Lightning was no exception. In his case, he'd given up his costumed identity and powers due to guilt over the accidental death of a bystander named Trina Shelton, whose family would eventually return to get revenge. With that story, Barr and Aparo underlined one of Jefferson Pierce's more interesting qualities: despite the fact that he was a vigilante with devastating powers, he had always been a character who abhorred violence and was well aware of its consequences. I'm the one who taught him to fly! 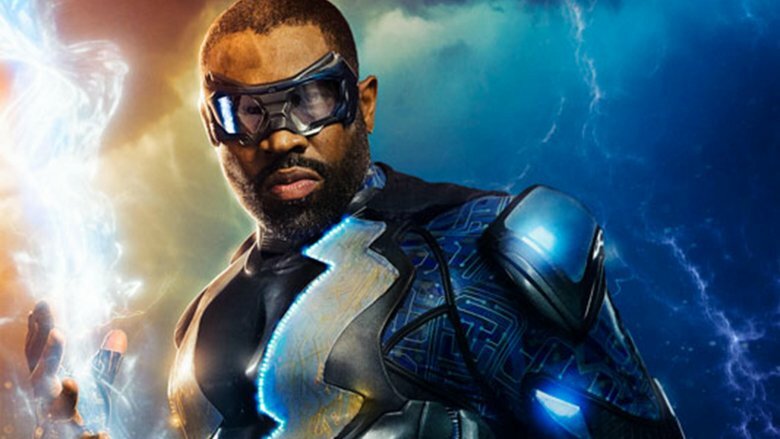 While Black Lightning's presence as a major hero on television is certainly a new development, Cress Williams isn't actually the first actor to ever play the character in live action. 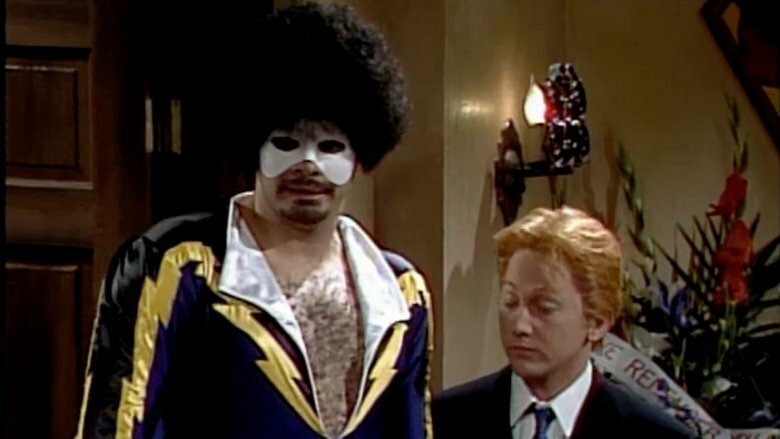 That honor, believe it or not, goes to stand-up comedian Sinbad, who took a brief turn as Black Lightning on a 1992 episode of Saturday Night Live. In a sketch set at Superman's funeral, tying into the then-current Death of Superman storyline, cast members like Chris Farley, Mike Meyers, and Chris Rock appeared as Superman's fellow heroes for some mourning mixed with surprisingly deep-cut comics references. Unfortunately, it seems Black Lightning wasn't invited, leading to an altercation with Jimmy Olsen that reveals SNL's special effects department wasn't quite sure what actual lightning looked like. It's not the most flattering portrayal for sure—and the part where Batman doesn't recognize his old teammate is a real heartbreaker—but it is an interesting bit of pop cultural prominence for a character who, despite his historical importance at DC, was still pretty obscure for mainstream audiences. In one of the stranger plot twists for a superhero, Black Lightning's next prominent move happened out of costume, and in the White House. In 2000, a long-running storyline culminated in Lex Luthor being elected President of the United States of America, mainly because Superman himself decided not to go on TV and tell everyone "hey, that guy has tried to murder me with killer robots for the past 62 years." Once he was elected, he took office and in Superman #166, he immediately stocked his cabinet with a bunch of characters who met two very important qualifications: they were people readers had heard of, and they were extremely loosely tied to the roles they'd be taking in government. General Frank Rock, formerly Sgt. Rock of the comic of the same name, became Chairman of the Joint Chiefs. Clark Kent's old Daily Planet coworker Cat Grant became Press Secretary. 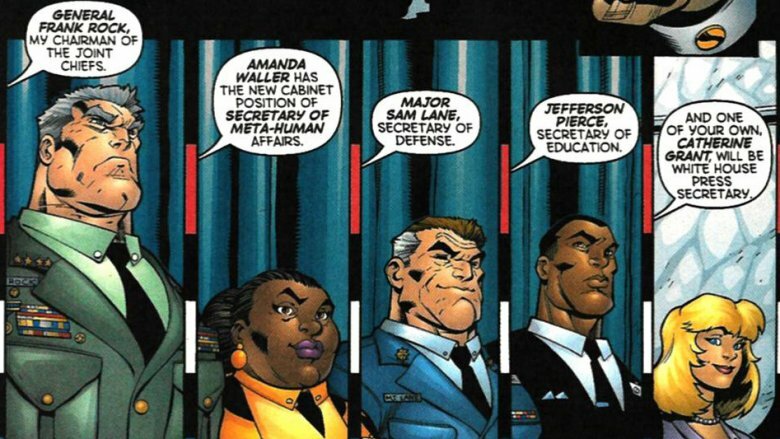 Suicide Squad's Amanda Waller was named Secretary of Metahuman Affairs, because running a secret team that sent criminals on missions that the government could not officially acknowledge made her the perfect person for a public-facing position, and the Secretary of Defense was Lois Lane's dad, because Lex Luthor wants nothing more than to create drama. Jeff Pierce, of course, became Secretary of Education, which is a pretty weird job to give to a high school teacher with no prior government experience, even if he does have a couple of gold medals. Apparently those hometown connections go a long way. While his presence was thought to be a way to get the good guys a mole in Luthor's office, he ended up resigning during a scandal involving his vigilante activities, giving us all a good reason to keep secret identities secret, even if you're on the campaign trail. With Black Lightning's ties to the original roster of the Outsiders, it's not surprising that he'd have a connection to the team when a new version was put together in 2003. In Outsiders #1, Judd Winick and Tom Raney introduced Anissa Pierce, alias Thunder, the oldest of Black Lightning's two daughters. Like her father, Anissa's original costume involved a wig that helped to hide her identity, and like her father, she added some much-needed diversity to the DC Universe when it was revealed that she was in a romantic relationship with another member of the outsiders, Grace Choi. Her powers, however, are completely different. Rather than throwing lightning bolts around, Thunder can control her density, making her nearly invulnerable. Oddly enough, Anissa's sister Jennifer both pre- and post-dates her, thanks to the weird quirks of superhero comics. A character meant to be Black Lightning's daughter appears in the non-canon 1998 Kingdom Come miniseries, by Mark Waid and Alex Ross, but is never identified in the comic itself, and is only referenced as "Black Lightning's metahuman daughter" in bonus material that appears in the paperback collection of the series. In 2008, though, thanks partially to Kingdom Come's enduring popularity, she was introduced to mainstream continuity as Anissa's younger sister, Jennifer. In 1979's Justice League of America #173, Black Lightning was offered membership in the JLA. Perhaps surprisingly, he turned it down, becoming only the second character ever to do so, after his future fellow Outsider Metamorpho, who declined membership way back in 1966. Almost 30 years later, he finally accepted. When the Justice League reformed after being disbanded for the fourth or fifth time, Batman, Superman, and Wonder Woman wound up literally sitting around a table with a bunch of trading card-style photographs of their fellow heroes, debating who they should let into the League. Meanwhile, a swamp zombie rebuilt a killer robot so he could turn Red Tornado human and then tear off his arm and eat it. This was considered to be the best way to relaunch DC's flagship title in 2006. Either way, Black Lightning wound up joining after the Justice League decided to just keep everyone who showed up to fight the latest crisis, and he stuck around for the next few years. More recently, though, with DC once again rebooting their universe in 2011 (and "rebirthing" it in 2016), he's back to being a solo hero. 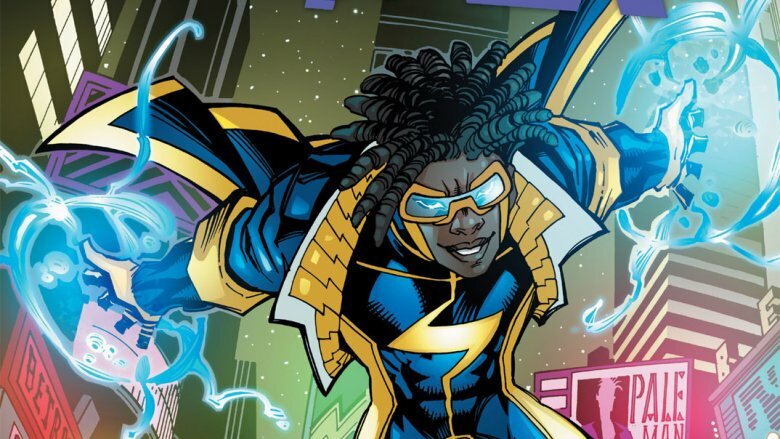 One of the common misconceptions about Black Lightning is that he's somehow connected to another electrically powered superhero: Static. The truth, however, is that the two characters are unrelated. Static was created by the aforementioned Dwayne McDuffie, Denys Cowan, Michael Davis, and Derek Dingle as one of the founding characters of Milestone Comics, an imprint built around the creation of new minority superheroes. While the Milestone comics were distributed by DC and crossed over with the mainline DC Universe, they were independent until 2008, when the characters were merged into the DC Universe proper. But it's easy to see why people have jumped to the conclusion that there's a connection between the two characters, especially with Static coming to pop culture prominence as the star of an animated series. They both have electricity-based powers, their costumes have similar color schemes, and as we've already seen, the idea of Jefferson Pierce's kids carrying on his heroic legacy isn't exactly out of the question. It's become such a well-known misconception that it's been referenced quite a bit in the comics and cartoons. In one episode of Static Shock, Virgil Hawkins met up with a very Black Lightning-esque hero called Soul Power, and McDuffie himself even made a joke about it during his run on Justice League of America. In #27, a crossover between the League and the Milestone characters, Black Lightning gets asked if he's Static's father. His answer is a simple, frustrated "No. Why does everybody ask me that?" With the new Black Lightning TV show, the CW is pulling from the entire history of the character in some pretty interesting ways. Cress Williams stars as Jefferson Pierce, who still works in education in his TV incarnation. The difference, though, is that rather than being a teacher in Metropolis, he's the principal of a high school in a city called Freeland who has dedicated his tenure to helping kids and eliminating violence. Like his earliest comics incarnation, the CW's Black Lightning is taking on the 100 and Tobias Whale, and getting his costume and equipment from Peter Gambi. Like the version that showed up in Batman and the Outsiders, he's been retired from superheroics for a while, driven to give up on being a vigilante by his aversion to violence. Anissa and Jennifer have already appeared on the show, with Anissa displaying the superpowers she has in the comics. It's been announced that Grace Choi will be showing up as a love interest for her, and while it's certainly far from being set in stone, the producers have indicated that they'd even like to have Static show up, too. The only thing that could really complete the saga is if they managed to get an appearance by Sinbad.